The drummer of the band, the keeper of the beat – author, Malcolm Knox aptly uses these analogies to sum up the role of the wicket keepers in Australian Test cricket. The keeper is both the most misunderstood role and person in any cricket team. With no reliable measurement of their performance they often receive praise or criticism, in equal measure, when not deserved. The usual method of rating a keeper, apart from batting averages, is based on the chances missed which Knox quickly dismisses as unreliable. He also, wisely, doesn’t attempt to develop a new formula to select the best wicket keeper, instead he asks former Australia keepers to rate those they have watched. The author gives his personal nod to the ‘Prince’ Jack Blackham and his logic is hard to refute. After all Blackham was the first choice keeper and considered the best in the world for 20 years. Blackham is where we start. The book though is not a collection of pen portraits of Australia’s Test keepers it actually tells the story of Australian cricket history through the eyes of the stumpers. This is a refreshing take which still allows Knox to describe the great individual performances of Aussies through the ages as well as the controversies of each era. A common theme throughout the book is the Grout catch cry of ‘don’t give a sucker an even break’. Almost every keeper seems to have been paranoid about losing his place behind the sticks to a rival, which sees them all play with injuries. From broken fingers, to strained ligaments, to a heart attack in the case of Wally Grout, the Keepers come across as a tough breed. The paranoia appears warranted with replaced injured keepers often struggling to find their way back into the team. Even seemingly ensconced keepers, at their peak, such as Rod Marsh and Ian Healy had regular concerns over losing their position. The other similarity between the keepers was their cricketing cycle. Unsure of their position at the start, before establishing themselves but still paranoid about their position before struggling to maintain interest and finally pushed or jumped. 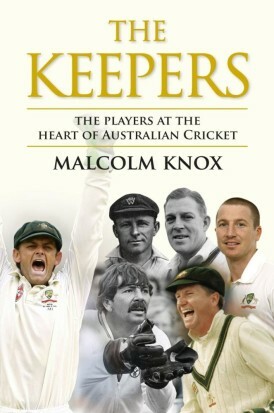 The strength of the book is the new material on keepers that Knox has uncovered. This is mainly due to the fact that he has interviewed most of the extant keepers and all seem to have been forthcoming not just on the competition between them and their rivals, although of great interest, but also regarding their treatment by selectors and team-mates. One noticeable person Knox did not interview was Rod Marsh, although I was not aware of this until I had finished the book, no mention as to the reasons Marsh was not forthcoming is mentioned. The reason I didn’t notice that Marsh was not interviewed is due to Knox’s research which, as always is thorough and commendable, appears to provide everything you need to know about the current Australian selector. Added to the impeccable research, there is not a typo in the whole book, which is a credit to all involved. I did notice a couple of very minor factual errors. However I think even if the page numbers were provided, on which the errors occur, 99% of the population would be unable to locate them*. The last book I can remember published on wicket keepers was by Jack Pollard back in 1993, which was a much slimmer volume. After this effort by Malcolm Knox there should be no need for another for at least a generation. Highly recommended. *please email us if you have a copy of the book and want the page numbers provided. No prizes but if you can find the errors, you will have our respect. *please email us if you have a copy of the Keepers and want the page numbers provided. No prizes but if you can find the errors, you will have our respect. McGilvray The Game Is Not The Same? One of the finest commentators of them all, and still the best produced by Australia. See what Archie thought of his first effort into the world of cricket books.